Elegant organization systems for plants & herbs. Proper storage will make your herb last longer and taste better. Limited light exposure has been proven the best way to sustain herb quality. 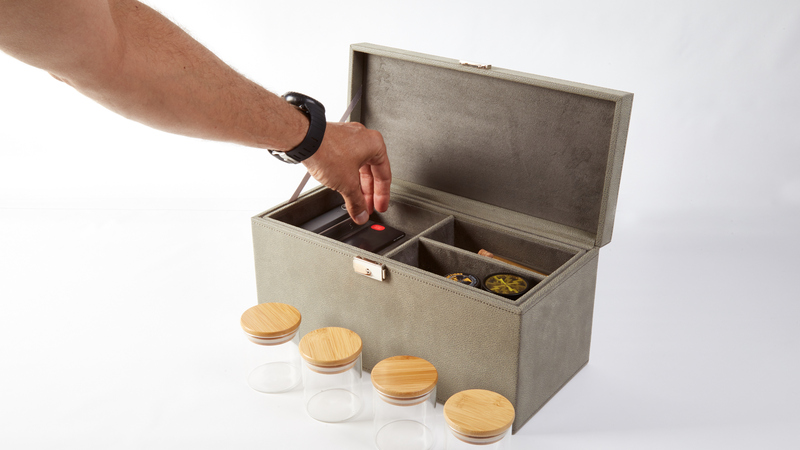 The Cache Box offers a cool, dark environment that will keep your herb tasty and fresh. While plastic storage causes terpenes to deteriorate, our glass jars preserve them. There are optional humidity control packs, so if things look dry, you can throw one in, allowing your plants to thrive. When you put your herbs in our supplied jars, and close the box, your flower will be 100 percent scent-free. We are committed to exclusively using the highest quality vegan leather. Million of animals are killed each year solely for their leather and animal production greatly adds to the pollutions of this earth. This is why we say no to animals products and animal cruelty. Beyond the technicalities, we have created a new way to enjoy flower. Designing products for all aspects of your life while incorporating artistic designs. We have made more than just a functional box for your herb, but a fun new way to experience it. A quick peak at your Cache box. Join our mission to elevate our experiences and be the first to know about the limited releases. Sign up to receive updates on our products & events. We will keep you posted and never spam.